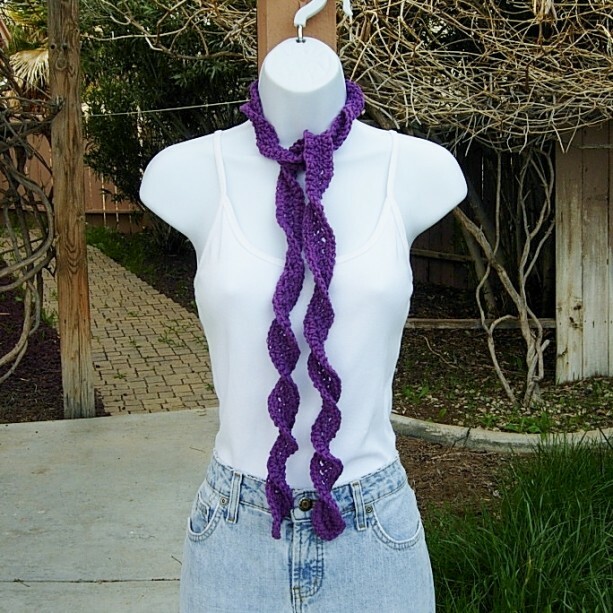 Dark Purple Cotton Summer Scarf Skinny Spiral Summer Scarf hand-crocheted with a 100% cotton yarn. Because the yarn is made of natural fiber, it's soft, comfortable, perfect for summer weather, and a great choice for anyone irritated by man-made fibers. This yarn also offers some fun color choices I can't find in acrylic yarns. The color is called Black Currant, a solid dark purple. This yarn is matte (no sheen). I can make these scarves in almost any length. Please send me a message if you'd like a custom version. 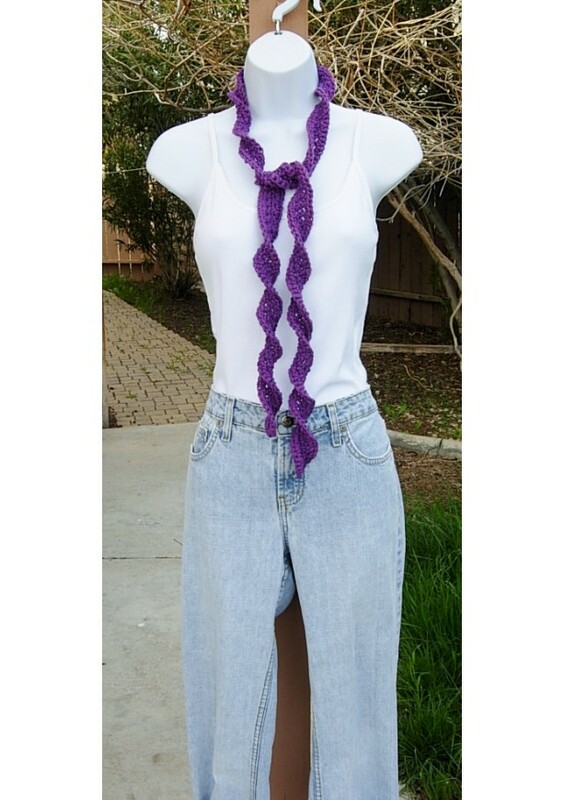 :) With the gentle twists inherent in the scarf, you'll find this petite accessory has a lot of beauty and dimension. 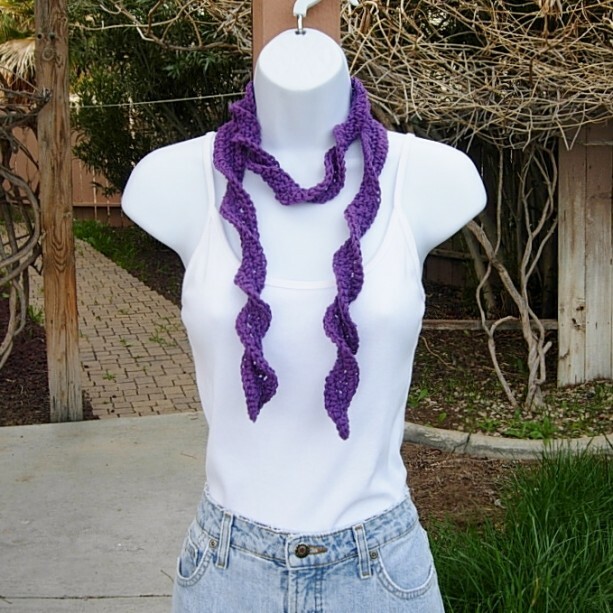 It can be worn around the neck in the many ways a small pencil scarf can be worn. 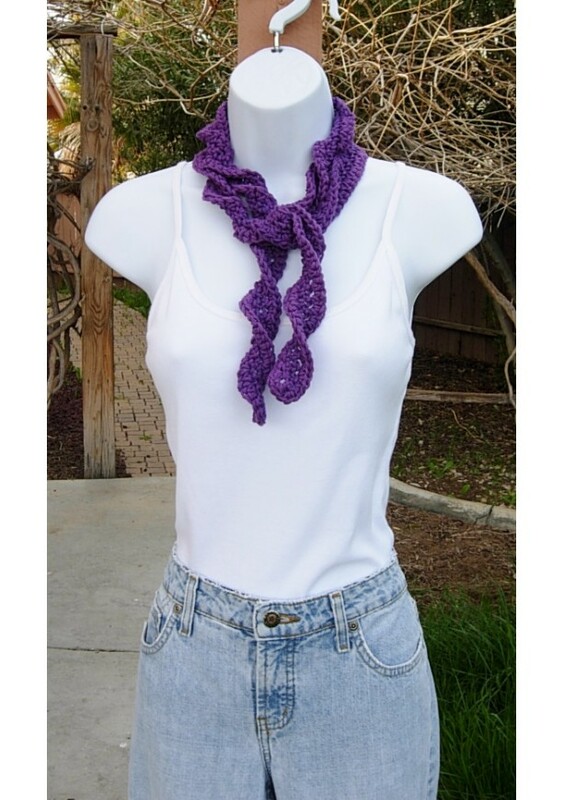 In some of the photos, I folded the scarf in half, placed it around the neck, then guided the two scarf ends through the loop. 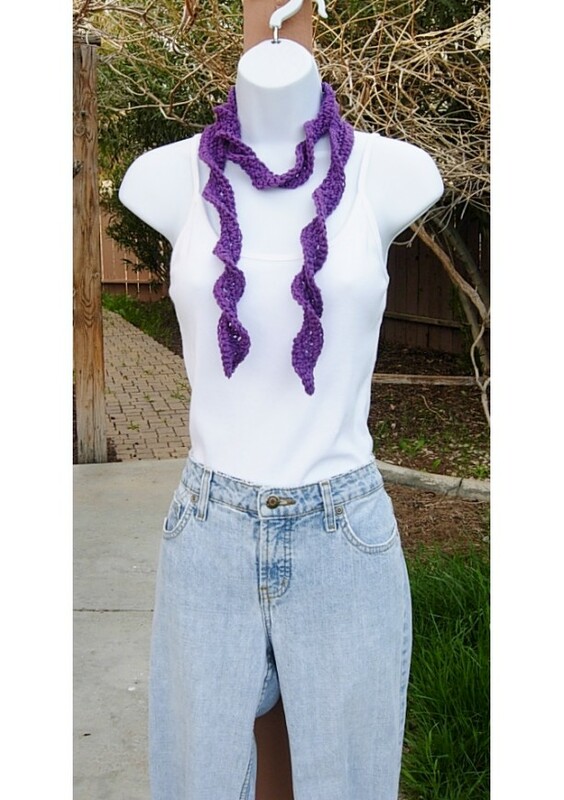 I design my summer scarves to be cool & comfy and generally worn away from the neck, but they do look really great as choker scarves with one loop close to the neck. Additionally, in cooler weather, they can be looped a few times to create a light neck warmer. 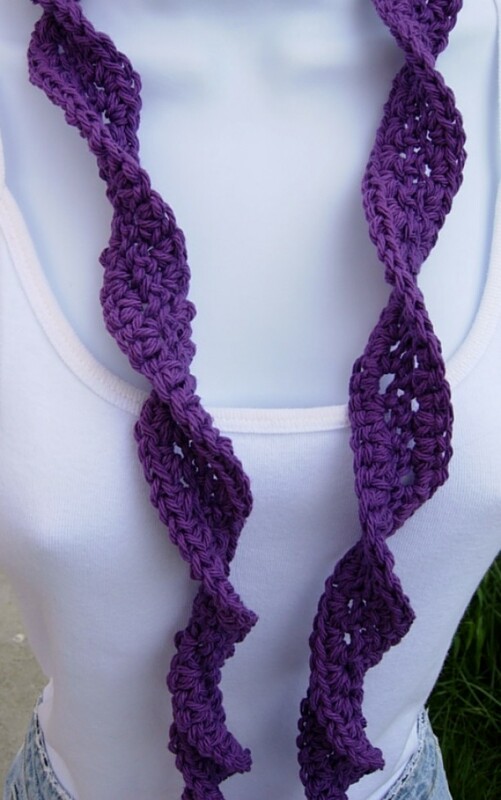 * Yarn Content: 100% Cotton * Yarn Brand & Color: Lily Sugar 'N Cream in Black Currant * Approximate Length: 54 inches/137 cm * Approximate Width: 1.5 inches/4 cm * Weight: 1.5 oz. 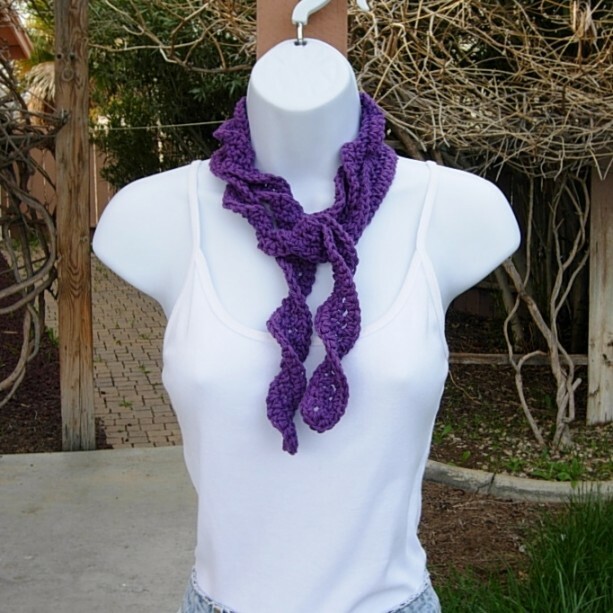 About the yarn used for this scarf: While in the world of fabrics, cotton and cotton blends are plentiful, yarn is a whole different story. 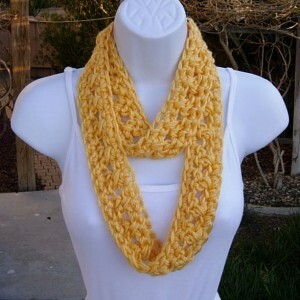 It's actually very difficult to find cotton yarns to use for crocheting and knitting. The few that are available are often expensive, heavy, or fade easily. 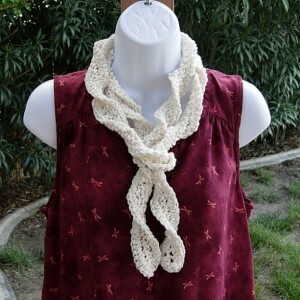 For this scarf I used one of the more popular cotton yarns available in stores called Lily Sugar N Cream. This brand is very good quality and extremely lightweight, but not originally designed for accessories like hats and scarves. I chose to use this yarn for a new line of small summer scarves after receiving so many requests for cotton. A great way to think of this yarn is as "fancy" dyed cotton string. It's extremely durable and softens when washed or worn, but the darker colors will fade a little with each washing (though using cold water will help a lot with that). With all that being said, I'm extremely happy with the way these scarves have turned out. 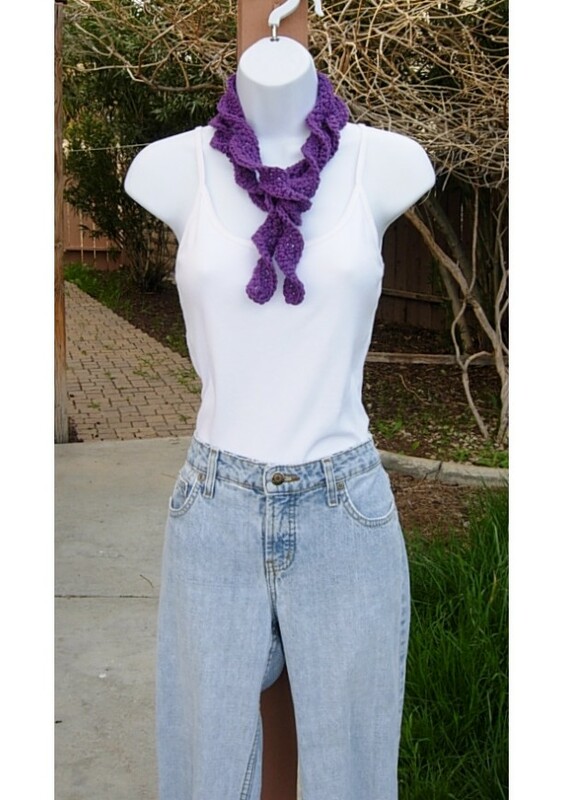 :D For scale, the mannequin in the pictures represents a small-sized woman (Size 0 or 2) with a neck size of about 12 inches. It's often helpful to look at a ruler or measuring tape to get a better idea of the width and length (shown above). CARE INSTRUCTIONS: * Care Instructions from yarn label: Machine wash or hand wash in cold water using a mild soap. Do not use bleach. Rinse well in cold water and remove promptly. Squeeze gently to remove excess water; or briefly spin dry in dryer on low setting. Re-shape and lay flat to dry. Wash colors separately. Some colors may run. * My Recommendations: I strongly recommend hand washing in cold water, reshaping, and laying flat to dry. The gentler washing & drying prevents the yarn from frizzing over time and will help lessen the fading of dark colors. Avoid washing with heavier garments that cause friction. 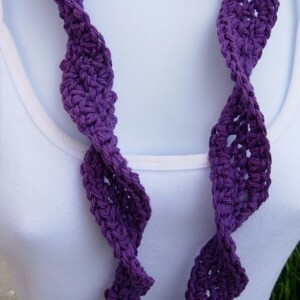 If using washing machine, enclose the scarf in a lingerie bag and avoid washing with items that have zippers, buttons, etc that may snag the yarn loops and pull on them or make the yarn fray.The general rule for washing crocheted items and keeping them looking as new as possible: the gentler, the better. (: The summer scarves are small enough that they're really easy to hand-wash in a sink, gently roll up in a towel to squeeze out excess water, then reshape and air dry. I like to add just a tiny bit of fabric softener when hand-rinsing to make the yarn even softer and static-free. Note: All yarns come with a bit of "factory residue" that causes a little stiffness. This will disappear with regular handling and/or the first wash, bringing out the true softness of the yarn. The striped cotton yarns tend to be the stiffest when new. U.S. SHIPPING: I keep shipping to a minimum and offer First Class Package as the best value for price & speed. For multiple orders, I often use Priority Mail. For Ready to Ship items, I'll ship within two business days. 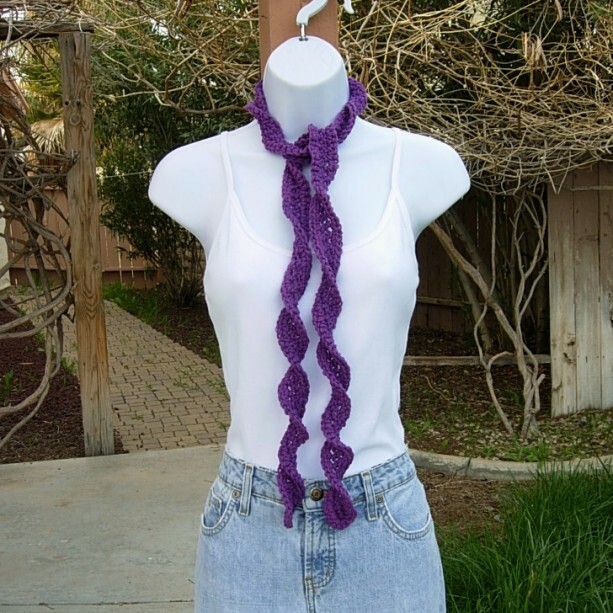 For items made to order, I'll ship as soon as I have the scarf finished (within the time-frame stated in the listing title). I use the PayPal/USPS integrated shipping system whenever possible, so you will be provided with a delivery confirmation number by email from PayPal and/or Aftcra. Most First Class packages take two to five days to be delivered. INTERNATIONAL SHIPPING: I always combine shipping for multiple orders. I most commonly use USPS First Class International for shipping outside of the US. First Class International may take a longer time to arrive than other services, but it's much more affordable than Priority International (which usually runs $25 or more for a few ounces). Delivery time for international packages is usually 5 to 15 business days. Customs, bad weather, or national holidays can sometimes slow down a package with the occasional shipment taking around 30 days to arrive. This only happens to about 5% of my international shipments. (: In the last four years, USPS has raised prices significantly for First Class International, in some cases more than doubling the amount they used to charge before 2013. On a positive note, as part of that price increase, they include tracking and delivery confirmation as part of the First Class service for almost all the countries I ship to. To keep shipping costs down, I will use lightweight polymer shipping envelopes as often as possible. For multiple items, I may find a cardboard box is best. International Buyers Please Note: Import duties, taxes, and charges are not included in the item price or shipping cost. These charges are the buyer's responsibility. Please check with your country's customs office to determine what these additional costs will be prior to buying. PAYMENTS: I accept PayPal. If you don't have a PayPal account, you will still be able to pay with a credit or debit card through PayPal. You can also pay from your bank account using an E-check (also through the PayPal system), but I won't be able to ship until the check has cleared, PayPal says it's okay to ship and allows me to print out a label. RETURNS: For now, I am not accepting returns, but am completely open to resolving any problems that may occur. I feel the best strategy is to head off any problems before they even happen. If you have any questions whatsoever about any items I am selling, please ask. Thanks for looking!